Lactose intolerance or dairy allergy means the inability of the body to digest lactose, a form of natural sugar present in milk and dairy products. When the patients with lactose intolerance consume milk or dairy products, they suffer from bloating, and pain in the abdomen. Most patients consider lactose intolerance and food allergy to milk to be the same. However, both of these are different conditions. Lactose intolerance occurs due to the digestive problems, which results in the inability of the stomach and intestine to digest lactose while the allergy to milk occurs due to an abnormal response of the immune system to the same. In lactose intolerance, the lactose moves through the colon without being digested, resulting in uncomfortable symptoms like flatulence, bloating and belly pain. The symptoms usually begin about 30 minutes after the consumption of milk or dairy product. The other symptoms of this disease include cramps in the abdomen, loose motions, gurgling and rumbling sounds in the belly and vomiting. The symptoms can be mild to severe, depending on the amount of an enzyme known as lactase, which is produced in the intestine. Lactose intolerance occurs due to the lack of or insufficient production of lactase in the small intestine, which is needed to break down, and digest lactose. Lactose intolerance and dairy allergy may occur after the small intestine stops producing lactase following an acute illness like stomach flu or a chronic disease like cystic fibrosis. The production of lactase may even be affected due to the damage to the small intestine or removal of a part of the small intestine during surgery. In these cases, the symptoms can be either temporary or permanent. Patients suffering from this problem can seek lactose intolerance treatment using the herbs recommended by Ayurveda. The severity of lactose intolerance varies among different patients. 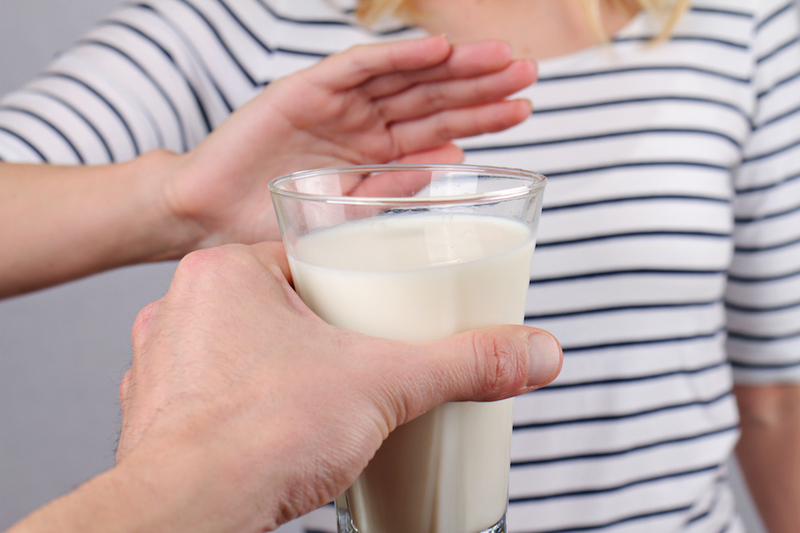 Some patients can not digest any milk product while some can eat and drink a small amount of milk or consume certain types of milk products without developing any symptoms. Lactose intolerance poses a big challenge for the patients as they have to avoid the discomfort caused due to the consumption of milk and dairy products and also ensure their body gets enough supply of calcium for maintaining the health of bones and teeth. Ayurvedic medications can provide relief from the intolerance to dairy products and allow the patients to consume milk without causing any discomfort, which is considered a complete food. Lactose intolerance usually runs in families, and the symptoms tend to develop during the adolescence or adulthood. The incidence of this condition is higher in the Native Americans, Asians, Africans, and the South Americans. This condition can also occur in the newborns, though rarely. It may occur temporarily in the premature babies because of the improper development of the body at the time of birth due to which the digestive tract is not able to produce lactase. As a result, the child is unable to consume milk. However, the lactose intolerance typically goes away after the small intestine begins to produce lactase. By taking alternative herbal ayurvedic medications can relieve these lactose intolerance symptoms in adults and children. The patients suffering from this condition should know the foods to avoid preventing the lactose intolerance symptoms from occurring. They should avoid eating and drinking milk and the dairy products like yogurt, and cheese. However, care must be taken to replace the nutrients present in the dairy products, especially calcium, so that the body is not deprived of its source of essential vitamins and minerals. The diet plan for lactose intolerance should include the foods that are high in calcium. Since milk is also a good source of vitamin D and fiber, the lactose intolerance diet should include foods that can replace these nutrients. There are several ayurvedic herbs, which can help the patients who are suffering from lactose intolerance, to control the symptoms and manage this condition. The Indian traditional medicine in Ayurveda, offers a long-term approach for managing this disease that is aimed at relieving the symptoms such as bloating, flatulence and abdominal pain while promoting the digestion of lactose in the intestine. Bilva (Aegle marmelo): Bilva helps to treat lactose intolerance by stimulating the digestive fire and improving the ability of the intestine to break down and digest lactose. This herb is also used to treat the other disorders affecting the digestive tract such as inflammatory bowel disease, and irritable bowel syndrome. ​Vacha (Acorus calamu): Vacha is a commonly used herb for the management of lactose intolerance. It provides relief from the symptoms of this disease and also stimulates the functions of the digestive tract. ​Giloy (Tinospora cordifolia): Giloy is recommended for the patients who suffer from severe bloating, flatulence, vomiting, and abdominal pain or cramps due to lactose intolerance. ​Vaividang (Embelia ribes): Vaividang reduces nausea, and vomiting caused due to lactose intolerance. It also boosts the breakdown and digestion of food in the intestine thus reducing the symptoms caused due to mild lactose intolerance. ​Mulethi (Liquorice): Mulethi produces a stimulatory effect on the digestive system. It promotes the functions of the stomach and intestines and prevents the symptoms caused due to the inability of the body to digest lactose. ​Daruharidra (Berberis aristata): Daruharidra is a highly effective lactose intolerance remedy. It regulates the metabolic processes in the body and improves the digestion of food. This helps to control the symptoms of lactose intolerance. ​Kutaj ( Holarrhena antidysenterica): Kutaj can help to treat lactose intolerance by producing an antispasmodic action. It reduces pain and cramps in the abdomen. It also reduces nausea and vomiting caused due to this disease. It boosts the breakdown of food in the digestive tract and helps to minimize the symptoms. ​Mustak (Cyprus rotundus): The use of Mustak is highly recommended for the patients suffering from lactose intolerance. It reduces the symptoms caused due to this condition and ensures proper digestion of food. Most patients with lactose intolerance believe that avoiding milk and dairy products is sufficient to control the symptoms of this disease. However, it should be noted that learning about the lactose intolerance foods to eat is as important as learning about the which foods to avoid. They must be aware of the foods they should consume to achieve a long-term lactose intolerance relief and avoid the complications that may arise due to the lack of nutritional supply to the body. Ayurveda offers an effective treatment for dairy allergy that helps to relieve the symptoms of this condition and also supports the digestive functions. Patients can seek management for this disease at our Melbourne wellness centre. Our Australian based doctors are master in prescribing alternative ayurvedic medicine that possesses digestion-boosting properties and also provides the necessary nutrition to the body. Ayurvedic doctors at “Pure Herbal Ayurved Clinic” also recommend ayurvedic diet that can help to improve the digestion and prevent bloating, vomiting, and other symptoms of lactose intolerance. These herbal medications are safe for adults as well as children suffering from this disease. Our ayurvedic practitioner in Melbourne believes in managing this disease in a holistic manner to ensure that patients are relieved of the symptoms while improving their overall health.